So the last time we had a leisurely two hour meal at a restaurant along with friends was maybe in 2009. Pre-arrival era of the pint-sized food critic. Our modus operandi post PFC has been order-eat-get out, preferably in that order. So far our shortest sprint has been about 20 minutes door to door. We progressed from eat while he sleeps mode, to entertain him with shiny objects while we eat mode, to tag team while one of us eats mode which steadily climbed to an easy one hour meal in the post the-device-that-cannot-be-named era. Although his device of distraction is fairly old school, and not the shiny inedible fruit version – for now. Given that we are always sprinting for meals, it was a pleasure not to be running on a timer and be able to connect with new friends that I should have met three years ago. 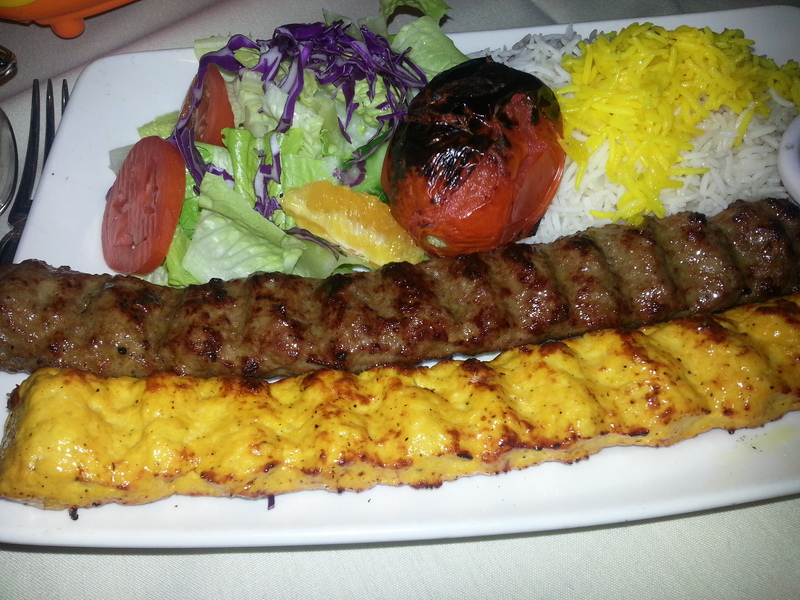 They suggested meeting up at Arya Global Cuisine in Redwood City for a Persian meal. 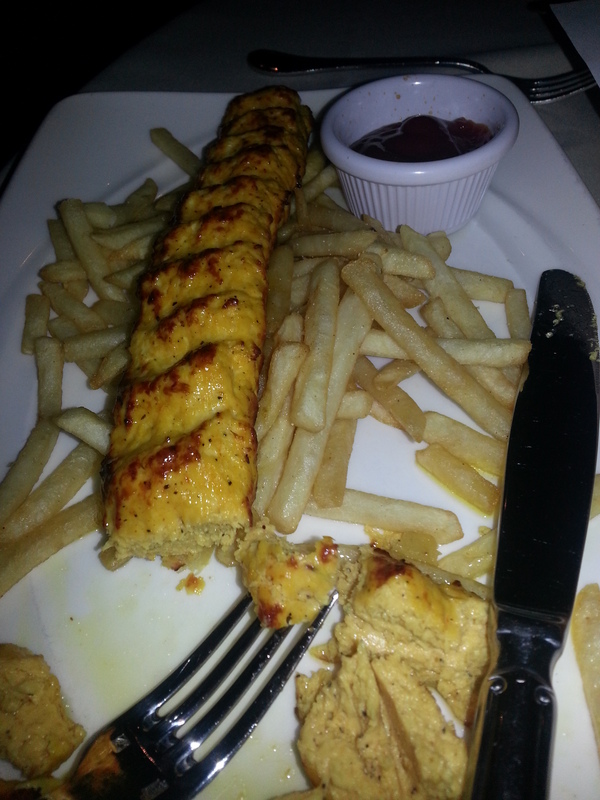 Given that this one had escaped our halal radar TBH and I were both curious and well, we never refuse good koobideh. Arya is located in downtown Redwood City which is clearly buzzing with activity on a Saturday evening. They place looks fairly upscale with nice décor and an attentive staff and they seated us fairly quickly and even produced a kids menu which surprised me a little. Although that may be because PFC makes a snort of derision at kids menus and tosses them contemptuously over his shoulder as you’ll remember his penchant for my entrees. But this kids menu I noticed as I drifted downward had koobideh – got to love a kids menu that lists koobideh along with the usual suspects. It also had a learn Italian/Farsi words which was a little nice touch along with the color kiddo activities which keeps PFC entertained for precisely 10 seconds after which he derisively tosses it over his shoulder. So expecting Persian fare, I was a little surprised to be presented with Italian and American options. Clearly I wasn’t paying attention to the Global bit in their name, though, I like my cuisines un-fused thank you, though I guess if you want to cater a little to everyone it makes sense? Yes? Also noted at the bottom of the menu is the fact that the meat is halal. So says the fine print on the menu you know, right next to the corkage fee. So if the foot long bar didn’t clue you in, entertainment is in the form of a nimble belly dancer on Saturday nights might. You have been forewarned if your sensibilities are a little sensitive. Told you we are kookoo for it! koobideh and Cornish hen. The meat was moist, and tasty, the half rice, half salad was a good call by yours truly since the salad was fresh though I found the rice a little bland, which is odd since most Persian places have really flavorful rice and we enjoyed the tahdig . The food was plentiful and in fact possibly too much – we had to take some home – a first for us since we are fans of both emptying our plates and wearing elastic pants. But the real deal and here I shifted allegiance all the way to Italy, was a pistachio cheesecake with swirls of dark chocolate and raspberry which was deceptively light and airy and vanished in minutes. I am not sure it quite compares with our two other Persian favourites Shalizar and Paradise Kabab House and the prices were on the higher side. Overall, we enjoyed the company of new friends and a leisurely meal which in three years has been a first for us. *Raises her glass* (filled with non-alcoholic beverage if you must know) and here’s to many more!